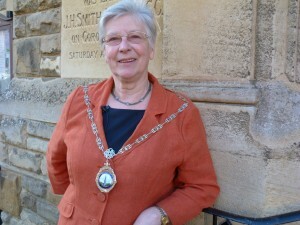 For 26 years Gwen Radcliffe has been an active member of the Town Council. Her record of service to the community consists of the role of chairman twice and mayor three times. Her most recent tenure as mayor this year also marked the year when she retired from the council. Radcliffe moved to Oundle in 1971 when her husband took up a teaching position here. Her sense of responsibility and ambitions for the town were initially provoked by the shabby recreational grounds and facilities for young children. The badly maintained and old fashioned playground facilities were a concern to Radcliffe, who had two young sons at the time. She was her ‘usual vocal self’ when discussing the issue at the Oundle Young Wives. In 1979, a neighbour and member of the council, Lotte Mason suggested she take action by running for election to the council, where she might be able to direct change. The ratio of women to men on the council has never been balanced. Radcliffe stresses, however, that apart from one early incident, she never encountered any sexism. The 1970s was a ground-breaking period, and when she joined her first council meeting, a male colleague suggested that she should be on the properties committee ‘to choose the colour of the paints’. She had no hesitation about establishing her proper place at the table. Radcliffe emphasises the importance of community members to take time out of their day-to-day lives to participate in council work for the benefit of the community. In particular she urges more women to put themselves forward for election. Radcliffe worked part time when she first joined the council, and has in the past worked full time while serving as Mayor of Oundle. She understands the pressure of balancing work and family life with unpaid work. Despite repeated encouragement to stand for the District Council, Radcliffe has always declined, as she firmly believes that having multiple tiers is essential to maintaining links with the local community. She is a stout promoter of the importance of town councils, and joined the National Association of Local Councils in 2005, working as an executive of the finance committee until 2011. The highlights of Radcliffe’s career in the council are numerous. She was immensely proud to have been involved with the opening the Courthouse, which she calls her ‘third baby’, and then to see her son married in the same building. The refurbishments of the Drill Hall and the Queen Victoria Hall were also significant achievements for the council. The council’s latest project, the refurbishment of Fletton House, funded by the sale of the Drill Hall, will provide a whole range of resources to the Oundle community. The facility will be a ‘community hub’, with a pre-school, dance studio and spaces for young people, as well as new offices for the council. Radcliffe will not be moving with the council to its new 21st century home, but the project will stand as evidence of her legacy of nearly 30 years of commitment and dedication to Oundle.